Contemporary Gemstone Jewellery inspired by the colours and textures of the sea, the beach and the coastline using Semi-Precious Stones, Pearls, Shells, Crystals, Ceramic and Silver. All of my unique handcrafted jewellery - necklaces, bracelets, pendants and earrings - are made in the UK by me. Sometimes I also find lovely rings or stones that I think will fit very well onto my collection and I will add those into my online shop. Pearls and gemstones have their own natural beauty and are perfect for incorporating into my jewellery designs, whilst crystals and silver add that shimmering, sparkling quality. I also use ceramic beads which have on organic and earthy feel to them. Crystals and pearls work together wonderfully for Bridal Jewellery as they have such an enduring quality. Many of my jewellery designs include starfish, shells, and mermaids and I spend much time looking for interesting beads and charms which reflect the ocean and what it is hiding! I also love using handmade glass beads which can be incredibly beautiful and intricate and I am in awe of the people who make them. 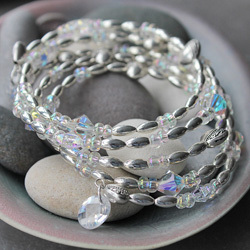 They are comprised of layers of glass which can result in having the effect of looking like precious stones. A natural semi-precious gemstone is a mineral, stone or organic matter which has been formed by nature over millions of years and no two are exactly alike -which makes them pretty unique! They have a depth and beauty to them which is often enhanced by small imperfections and inclusions. They can be artificially dyed but I think they look far better in their natural colours. Labradorite is one of my favourites because of it's distinctive flashes of blue. I also love all the jaspers -so many shades and textures. Pearls - Cultured, Freshwater, Swarovski, glass -which to use? Pearls come from all over the world, and are found in a variety of sizes, shapes and colors. Provided they are not imitation, real pearls are either formed by natural or cultured means, in either fresh or saltwater. Although natural pearls may cost more because they are harder to find, the fact that they are natural alone does not make them of higher quality than their cultured counterparts. 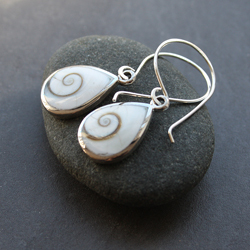 Personally I prefer using freshwater pearls -they have a lovely natural shape and lustre. Metals - I use mainly either sterling silver, silver plated metals, Tibetan silver or Hill Tribe silver -all of which have differing percentages of real silver in them. I always state in my descriptions which one I have used. To make your purchase even better each item is prettily wrapped so they are perfect for gifts. I hope you enjoy shopping for jewellery online on this website. I have also added some handmade bags to my shop - I hope you like them !